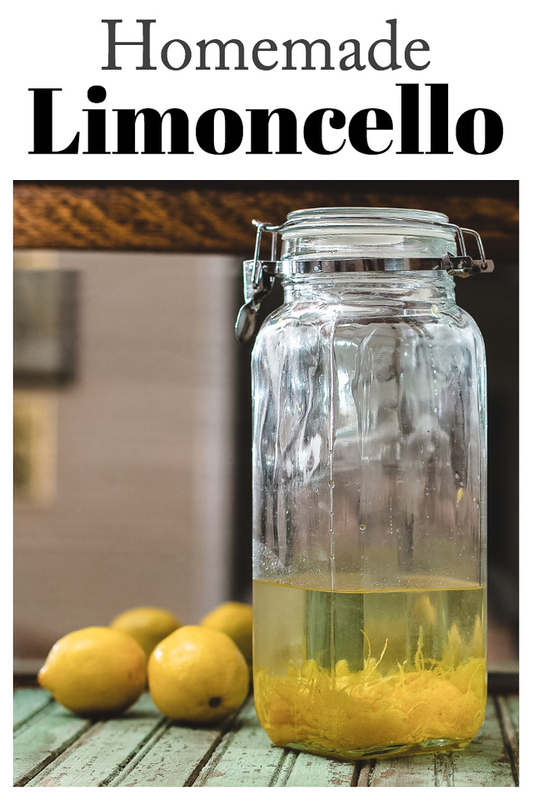 Homemade Limoncello is so easy and delicious, you’ll want to do what I do, which is start a new batch as soon as the first batch is finished! One of our favorite homemade liqueurs! Click here to pin this Homemade Limoncello now! I’ve posted a limoncello recipe before. Wow, I can’t believe that was all the back in 2011. But since that time I’ve made batch after batch of limoncello. It’s that good. Once you try your homemade, you will never be satisfied with store bought again. This is so easy, it’s one of those recipes where time does most of the work. Oh, there is a little labor in zesting and juicing the lemons, but it smells divine and it’s all sunny yellow. You want to start out with organic lemons. Since you are soaking the zest in the alcohol, you don’t want anything with pesticides on it. 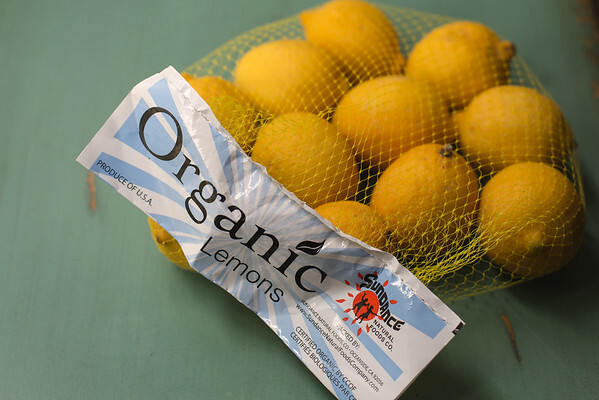 If you don’t have organic lemons, just be sure and scrub yours really well. When you are zesting the lemons, you want to try and avoid the white pith and just get the yellow part. 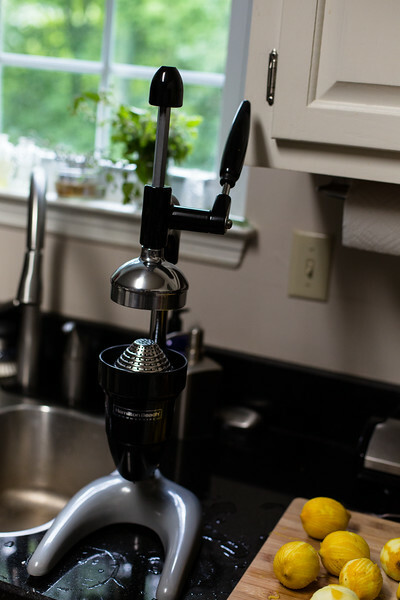 I used this OXO Good Grips Lemon Zester which made it a quick and easy job. In my original recipe, it called for 8 lemons, you used 4 at the beginning to zest and then 4 at the end for juice. I decided to double the liquid, but still only use 8 lemons, by zesting all 8 of them at the beginning and then juicing all 8 of them and storing the juice in the freezer until it was time for it. Genius! I know! My other secret weapon in my arsenal is a Professional Citrus Juicer – yes, I know it seems like a lot of money for a citrus press. But after buying countless cheaper ones that didn’t do a very good job, we decided to go for it and get this. We have never regretted it. It performs like a champ and gets so much more juice out that any other juice press that we’ve used. It sits on my counter and gets used all the time. Even if I just want the juice of one lemon, it’s so easy. The only thing I do different with it is instead of using the little black cup that comes with it, I remove that and just place a jar or measuring cup right under it, that way I can easily see how much juice I am getting. If you like margaritas as much as we do, this is worth it’s weight in gold in getting fresh lime juice! Now, I usually have a few people who tell me this isn’t real limoncello. That there are all kinds of other things involved in making a real limoncello. I’m okay with that. I like making homemade liqueurs – it’s fun. I like the way the way they taste, I like the process of watching and tasting along the way. This limoncello brings a sweet citrus flavor to your cocktails and I even used it in the glaze on this Lemon Yogurt Bundt Cake! 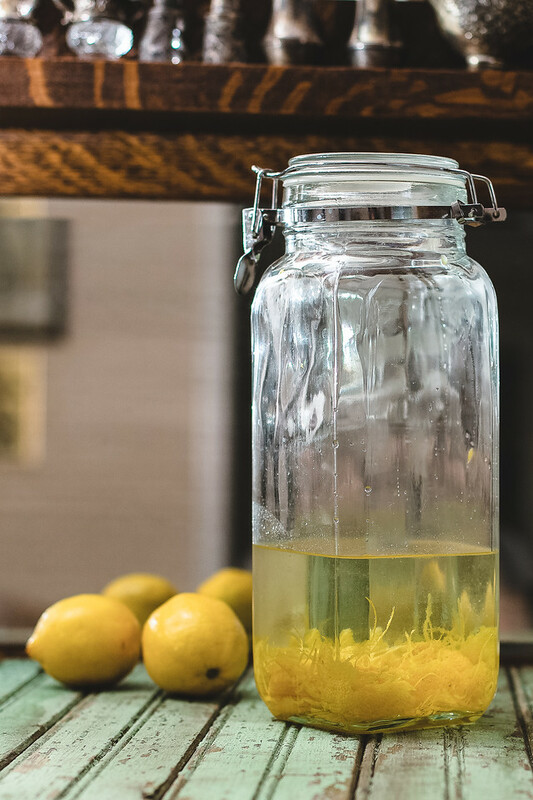 This Homemade Limoncello is so much better than store bought and time does most of the work! Zest the lemons and place the zest in a clean jar big enough to hold 8 cups of liquid. Juice the lemons and place the juice in a freezer safe jar or plastic ziplock bag and store in the freezer. Pour the vodka over the lemon jest in the jar. Close the jar and store in a cool dark place, shaking it daily. After two weeks, strain and discard the zest and pour the vodka back in the jar. Make a simple syrup by combing the sugar and water in a saucepan over medium heat, stirring until the sugar is dissolved. Pour the simple syrup in the jar with the vodka. Thaw the lemon juice and add it to the jar. Return to a cool dark place and let it mellow for about 6 weeks. Takes about a total of 8 weeks aging time. The first aging is two weeks and the second aging is 6 weeks. I can’t believe I left that off! You add the lemon juice when you add the simple syrup. I’m sure the refrigerator would work, it might take a little bit longer than when stored at room temperature. Your Limoncello looks amazing, Pam! I love the amount of lemon in it for flavour – and for health reasons too of course 😉 Seriously, this would make such a nice gift! Thank you so much for being a part of the Hearth and Soul Link Party. Wishing you and yours a very Merry Christmas! Hi Pam…this was really interesting because I also make limoncello and our recipes are so different…I also liked learning about that lemon peeler. I definitely need to get me one of those…I make the cream limoncello…and my recipe calls for a lot, which i like because at Christmas I bottle it up and give it away….I’ll post that recipe soon so you can see the difference. Not matter how it’s made, it is really good. Oh, yes, I would love to see your recipe! I love making things like this! Homemade limoncello sounds wonderfully flavorful! After trying the overly sweetened, viscous store-bought Limoncello, I was convinced I would never be a fan of the stuff. Once I tried homemade Limoncello, I had the “Oh, this is what it’s supposed to taste like!” moment. This is a great recipe. Thanks for sharing it! I know, it tastes completely different, doesn’t it?! I have a Pampered Chef zester which I just love! Lemon zest makes everything look so festive. I remember you writing about your limoncello before; it’s good to know you’re sticking with your traditions.